The Spain international has been with the Blues for the past three-and-a-half seasons and during this period, he has notched 37 goals in 173 appearances for the club. According to The Express, both Milan clubs are keeping a close eye on the Spaniard's situation with his existing deal with the Blues due to expire in June 2020. 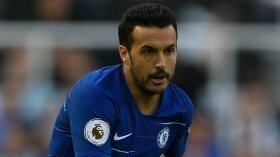 The west London side have usually followed a policy of offering one-year extensions to players aged above 30, and it appears that the Milan duo are prepared to take advantage of the same by offering Pedro with a multi-year deal. Still, the Capital outfit are likely to snub any advances for the summer, unless they can find a way of freezing the recent transfer embargo levied on them by FIFA. Chelsea are not permitted to sign any players for the next two transfer windows, but they remain hopeful of at least suspending the ban through FIFA or the Court of Arbitration for Sport by the end of the season.